The path from past to future has become delightfully twisted in our modern age. Some of the best new technologies mix old techniques with new. They treat the computer and electronics not as a separate entity, but for its potential hybridization. And one great example of that is gamut inc, a project that explores instrumental-electronic interactions. Founders Marion Wörle and Maciej Sledziecki came to visit us at the MusicMakers Hacklab we’re hosting at CTM Festival in Berlin. And they brought the most extraordinary inventions along. Gamut’s works are far-reaching, and their investigation of the future often starts deep in the past. The Avant Avant Garde festival turned to models from as far back as the Renaissance and Pythagoras, predecessors to modern experimental techniques in instrumental invention and computation that came long before even electricity. That international gathering led to performances from Poland to Berghain. Part of our challenge this week in the Hacklab is to see what can be learned from melding electronics and acoustics, digital and human. 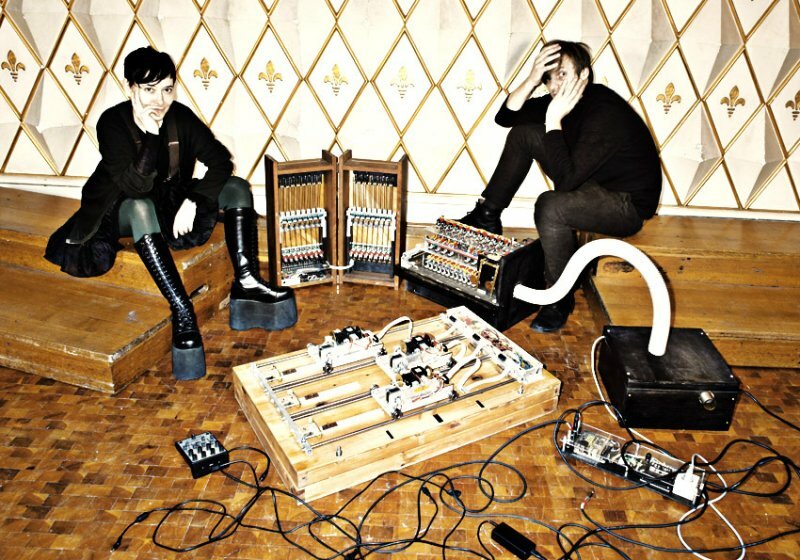 Gamut are delighting our CTM audience with their wild inventions – electro-acoustic-robotic oddities that seem to have fallen through a wormhole from an alternative universe. 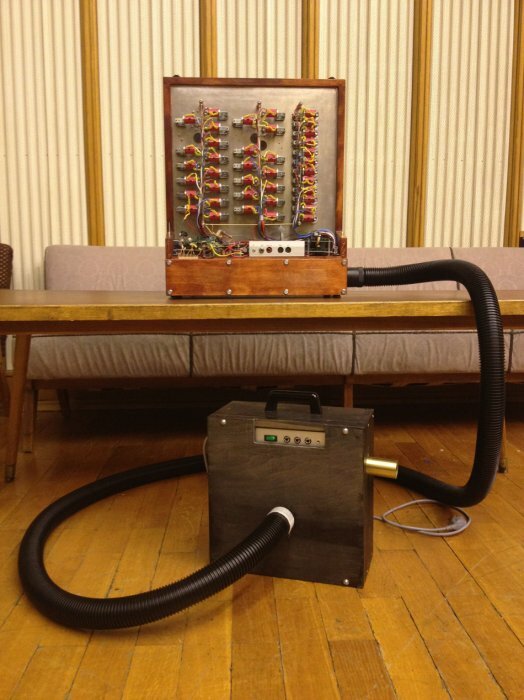 There’s the Physharmonica, which looks like a vacuum cleaner and a switch box had a love child that could sing. 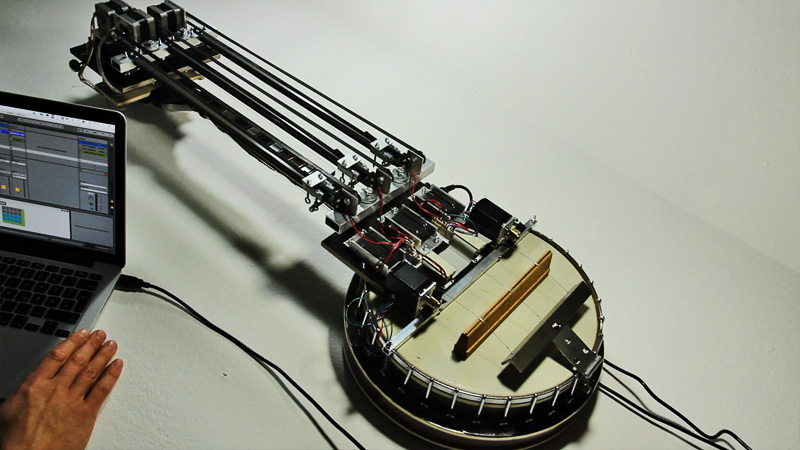 Or the Bowjo – a robotic rethinking of the banjo. The sounds can be delicate, as on their “retro-futuristic” carillon. And there’s a reminder of what’s happening – these instruments, as a class of similar inventions from around the world, are perfectly content being sequenced by Ableton Live. Part of the beauty of computation and digital representation is, there’s not necessarily a direct line between an object and a score. The output can be anything. We’re also telling our Hacklab participants not just to invent instruments, but invest care in how they should be played. And sure enough, Gamut make some beautiful music with their creations. Gamut are also serving as a hub for other musicians developing robotic, machine-instrument techniques, not just to focus on the novelty of those creations but the music that they can produce. It’s a beautiful age for new automata. I’m excited to go hear a proper performance with the group tomorrow at CTM.